International Series Standard Refill 6 Pack PRODUCE 6 BATCHES OF INTERNATIONAL SERIES BEER. Each batch makes approx. 2 gallons of beer in about 2-3 weeks. 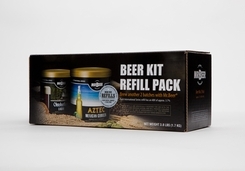 For the world-class beer afficianado, this package includes 6 of our International Series Standard Refills. Fresh versions of six classic styles, these carefully designed beers are sure to please. Note: Each Refill includes 1 Can of Hopped Malt Extract (HME), Dry Brewing Yeast (under lid of each HME), and No-Rinse Cleanser.